Although most people vacuum and clean their carpets on a regular basis, curtain cleaning is something that often tends to be overlooked. Curtains naturally attract odours and dust so in order to keep your house smelling and looking fresh and clean, regular curtain cleaning is essential. The problem with curtains is that once you’ve hung them in place, it’s all too easy to forget about them until you suddenly notice that they’ve become a bit of an eyesore. As with carpets it’s best to clean your curtains before they look really grimy – usually at least once every 3 months. This will keep them in good condition and help to extend their life while also making sure they smell clean and fresh. Some curtains can be washed in your washing machine at home without any issues, but it’s always wise to check the washing instructions on the label. If however your curtains are made from silk, or any other sensitive fabric, lined, or trimmed with beadwork or embroidery, your safest bet is to call upon the services of a professional cleaner. This is because the effects of the water, heat, and friction of the washing machine can all cause the fabric to fade, shrink, or become damaged in some other way. If your curtains are particularly dirty, then you might still want to consider using a professional curtain cleaning service since they will have the right chemicals and tools to achieve the best results. High levels of dust – If you live in an area that is particularly dusty, then you might need to clean your curtains more often, since curtains practically act as a filter for dust and particles which can enter through open windows. 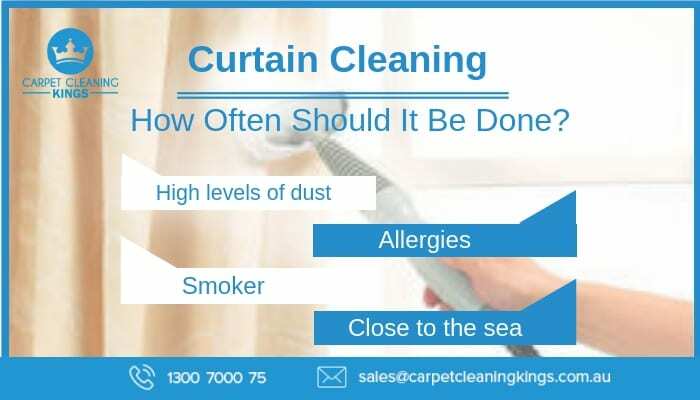 Allergies – If you or a member of your family suffers from allergies then again you might want to look at more regular curtain cleaning. Curtain fabric is a well known trap for all sorts of allergens including pet hair/dander, pollen, dust, and mould spores. Mould is particularly common on curtains in winter months when the windows aren’t opened as much as usual and the conditions are damp. Besides triggering allergies, mould spores can actually eat through fabric causing permanent damage to your curtains. 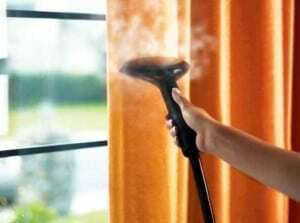 Smoker – If you or a family member smokes in the house then the curtains in your home will trap the smell of the smoke. Overtime, they may also start to turn a shade of yellow. In circumstances like these it’s best to open up your doors and windows as much as possible to let fresh air flow in, and clean your curtains every couple of months. Close to the sea – You probably already know that living close to the sea can play havoc with your window panes depositing a layer of salt, and this can affect your curtains too. In these circumstances it’s best to choose hard wearing curtains which can be machine washed frequently. We’re available to steam clean your curtains on site saving you the inconvenience of washing, drying, ironing, and hanging them again yourself. Why not give us a call for a free quote. Getting in touch is easy via our contact form or by phone on 1300 7000 75.